The 26.8 metre motor yacht Matsko has been sold with Filip Jerolimov at IYC representing the buyer and seller. 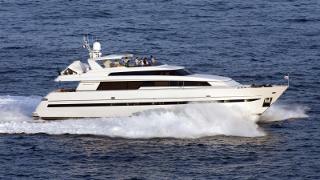 Matsko was built in GRP by the Italian superyacht yard Sanlorenzo as one of the yard's popular SL88 series. She was launched in 2000 and had an extensive refit in 2014 bringing her to immaculate condition. Accommodation is for eight guests plus four crew. Her guest area is laid out as a full beam master suite, VIP suite and a double and twin cabin. All cabins have entertainment centres, television screens and full en suite bathrooms with showers. The saloon has large windows allowing daylight to stream in, while her lounge area comes with L-shaped seating upholstered in cream leather, a coffee table and an entertainment centre including a 42 inch television screen. Forward is a formal dining area seating eight guests while further forward still is the galley with new appliances following the refit. The galley also has a table and banquette seating for sociable breakfasts and casual snacks. The popularity of this model is enhanced by her extensive deck areas offering plenty of space for al fresco entertaining including a sheltered cockpit making it the ideal spot for evening cocktails before dinner. Her extensive flybridge offers ample seating, a table and bar, all sheltered by a custom GRP hard top. Twin 1,862hp MTU engines give her a cruising speed of 21 knots and a range of 767 nautical miles at 11.5 knots. Lying in Split, Croatia, Matsko was asking €989,000.